For over an hour and a half, we're treated to James Franco's semi-humorous, semi-insane and full-out bad ego trip, writes J.P. Devine. James Franco and friends (Kristen Bell, Josh Hutcherson, Judd Apatow, Zac Efron and Franco’s brother Dave, with a walk-on cameo by Bryan Cranston) put their good sense aside and decided to use their various skills to make a semi-interesting film about a world-wide classic terrible movie — “The Room.” Do not feel down about not having any idea what any of this is. The original “The Room” was apparently made by stoners to be viewed by stoners with a cast that may have been made up of stoners. This is info you won’t need, but I’m compelled to give it to you anyway. I have to put together at least 560 words to make my editor happy, as she has to put together a decent page. It’s about a real-life character named Tommy Wiseau, a bizarre enigma of dubious origin, nationality and age who, with a mysterious source of several million dollars, decides in 2003 in San Francisco, to take up acting. Tommy is portrayed here by James Franco, as a combination of a drunken Marlon Brando, brain-damaged Lestat de Lioncourt, and your druggy cousin Lennie. Ha, ha! Tommy, wearing leather pants, multiple chains, buckets, bells and Kim Kardashian’s hair, takes an acting class and performs a scene from “A Streetcar Named Desire,” in which he dances around, climbs a ladder and simply screams “Stella” over and over. This is the point where those of you who loved “Maudie,” “Brooklyn” and “Downton Abbey” grab your purses and coats and head for the parking lot. In the class he meets Greg Sestero (Dave Franco), a totally lost wanna-be James Dean. They buddy up, head for Hollywood and stardom — and fail. 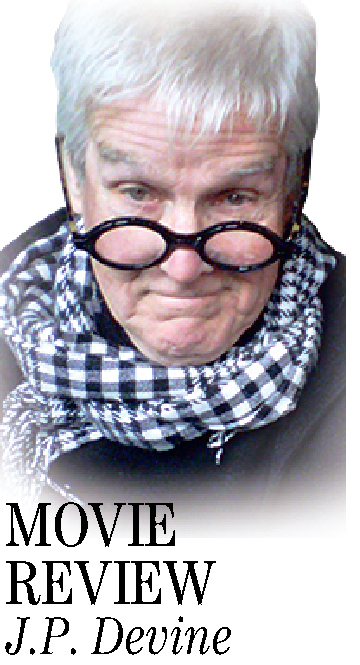 After repeated rejections, Tommy decides to make his own movie with his mysterious money, which became what film critics unanimously called the “Worst Movie Ever Made.” I can sense that I’m making this sound interesting; it’s unintentional. So crazy Tommy teamed up with his friend and co-star Greg Sestero. It was Sestero’s book about the cinematic debacle that excited Franco into playing this character in a film about the making of the original. Are you still with me? I can’t hear you from your car. 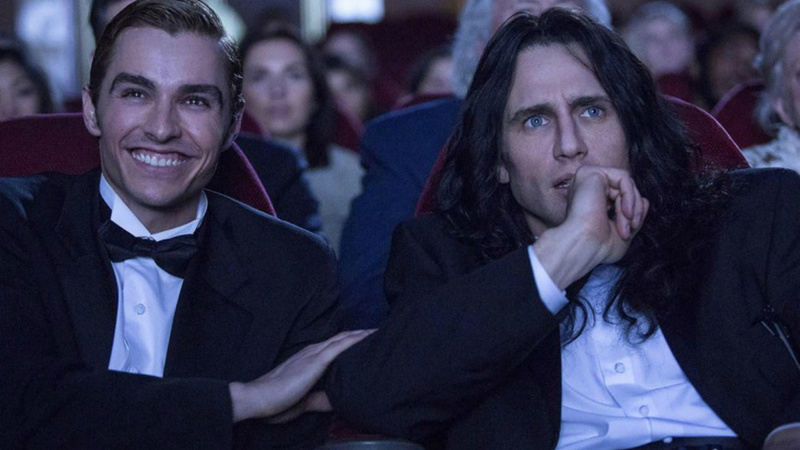 Franco hired the screenwriting team of Scott Neustadter and Michael H. Weber (“500 Days of Summer”) to bring Sestero’s book, “The Disaster Artist: My Life Inside The Room, the Greatest Bad Movie Ever Made” alive. Alive? So for over an hour and a half, we’re treated to James Franco’s semi-humorous, semi-insane and full-out bad ego trip. Franco’s interpretation of the very weird Tommy is, to my take, embarrassing and perhaps insulting. His Tommy Wiseau comes across as a damaged human being, who may have once been, before a serious accident in his youth, a stable, educated person. But Franco gives us a Marlon Brando, damaged by a serious stroke, struggling to speak, given to spastic ballet leaps, but still Marlon. “The Room” is shot, cut and edited and given a premiere in Hollywood to a full house who, for the first half, are horrified. Gradually, the gasps of disgust turn to laughter as they become convinced it was intended to be a comedy. Tommy, sitting center front, is horrified by the gales of laughter, but his friends finally convince him to accept his fate. Today, the film is considered a cult classic, and plays in late-night shows here and possibly in Transylvania. Come back! “Darkest Hour” is playing right next door.